Improvements to increase pedestrian safety have been temporarily put in place at the intersection of Wyoming Street and Nevada Way. 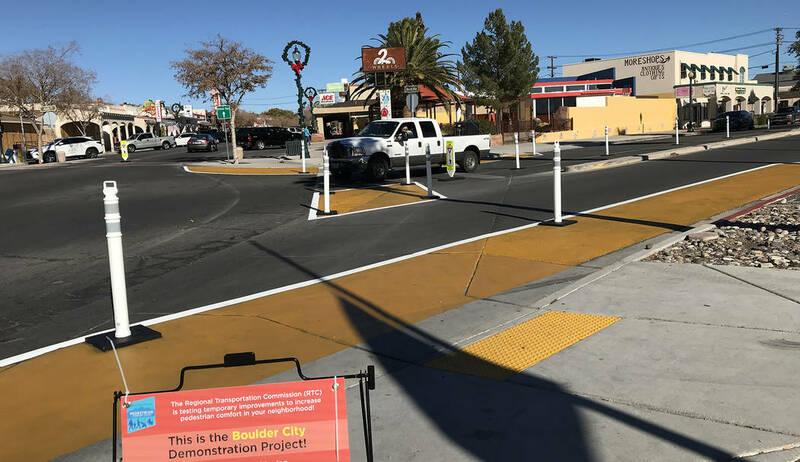 (Hali Bernstein Saylor/Boulder City Review) The crosswalks at the intersection of Wyoming Street and Nevada Way have been modified to increase pedestrian comfort and safety as part of a demonstration project by the Regional Transportation Commission of Southern Nevada. The improvements will stay in place until Jan. 3 as the commission accepts comments about the changes. More signage, a high-visibility crosswalk, turn lane reduction and an advanced stop bar are among the improvements installed Sunday, Dec. 2. They will remain there until Jan. 3. The improvements are part of a study by the Regional Transportation Commission of Southern Nevada to identify best practices for safe pedestrian usage of intersections throughout the region. The Boulder City intersection is one of six being studied for 30 days. According to Monika Bertaki, spokeswoman for the RTC, the Boulder City intersection was specifically targeted after an April survey by Alta Planning and Design showed that it was an area where improvements for pedestrians were needed. “We want to create a more walking-friendly Southern Nevada, and Boulder City made sense (to include),” she said. These types of crosswalk improvements have been used in other cities with success but are making their debut in Southern Nevada through the study, Bertaki added. The intersection is at one end of the historic downtown area that is filled with shops and restaurants. It also has unusual angles, which can be challenging for pedestrian safety. Mays said there is no cost to the city for participating in the study. “The city greatly benefits from our partnership with regional agencies, not only through the exchange of ideas but through resource allocation,” he added, citing RTC’s funding of the Boulder City Parkway complete streets project as an example. Andrew Kjellman, project manager of the pedestrian comfort study for the RTC, said the other intersections in the Las Vegas Valley are from communities that are part of the RTC’s jurisdiction. Once the 30-day demonstration is complete, the improvements will be removed. Cities can make them permanent if they want to, he said. Bertaki said feedback from pedestrians will be evaluated, and results of study are expected to be completed by June. During the study, pedestrians are asked to provide their opinions of the temporary improvements via a brief survey online at www.rtcsnv.com/pedcomfort.